One of my favorite course programs in the particular University of Life I happen to attend is Digital Fabric Printing with Spoonflower. I’ve been at it for years, and with each purchase—whether by me or another buyer, I have learned a little more about turning pattern ideas into beautiful, usable materials. I always send a thank you note to buyers, and I always ask what they’re making. That’s because A: I’m dying to know, and B: knowing helps me learn a whole lot more about design for fabrics (and wallcoverings, too). Over time, I’ve figured out a way to ask that seems to result in the most replies, but it’s not a sure thing. There are still a few folks who remain convinced that what they’re making is none of my beeswax. This buyer was one, and I’m almost over it. 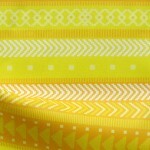 This rang a bell, so I dredged back through my Spoonflower messages, and found her! 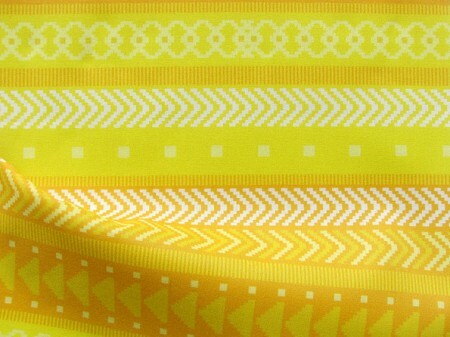 Eight organic cotton sateen yards of my vibrant yellow Greathearted pattern will be magically transformed into a bedspread for a Mexican villa. My whole body is smiling—my shoulders, yeah ok my mouth, my feet, my eyebrows—everything. Cross your fingers for a photo of the finished project! Also, get your own ? 2 Responses to What’ll she do with eight yards? I love ur stuff an hope you do get a pix. Good luck! !